Let's Stamp! : Even more reductions! Stampin' Up! have reduced the prices again on the retiring items list. If you still need to get your sale fix then click on the icon below. 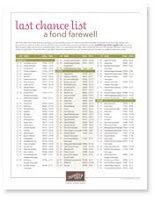 The list shows everything that will be retiring and won't be available in the new catalogue. The punches will be available in the new slimline format in the 2010/2011 catalogue. Some items are already selling out, so if there is something you want, grab it whilst you can. You can place an order directly with me by emailing me and payment is via paypal.